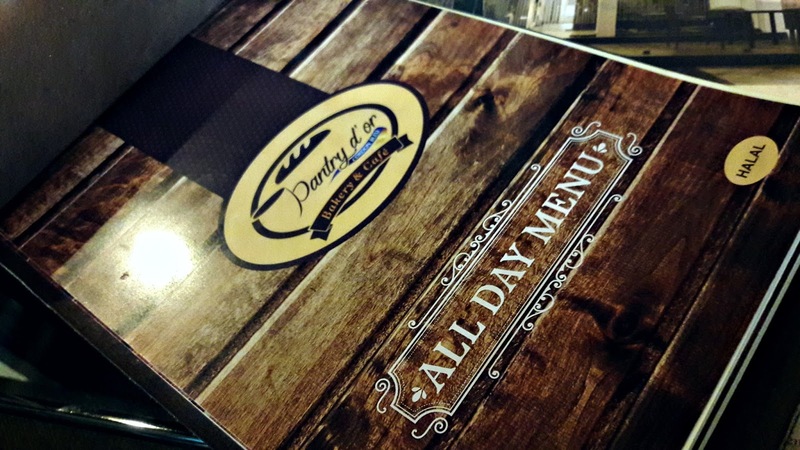 Pantry D'or Cordon Bleu is located in a quiet, leafy lane in Alwarpet. As you enter, the patisserie is to the right. 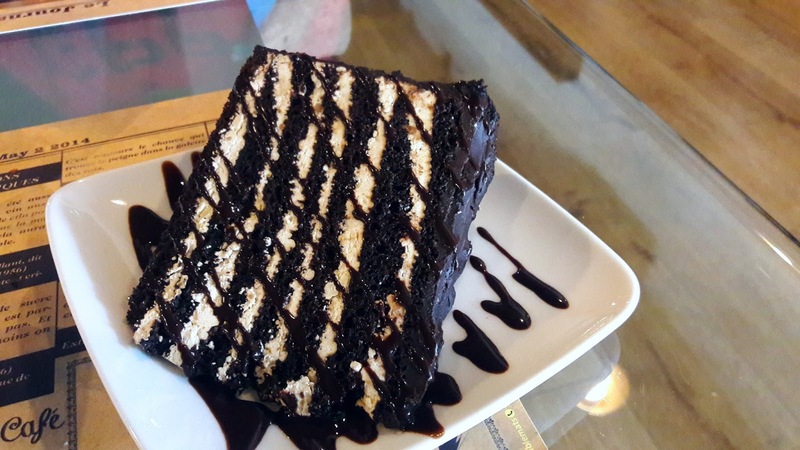 Invited by a friend to review it, it's a little difficult for me to move away as all the gateaux and bakes on display look trés chic; I do have a thing for beautifully executed slices. 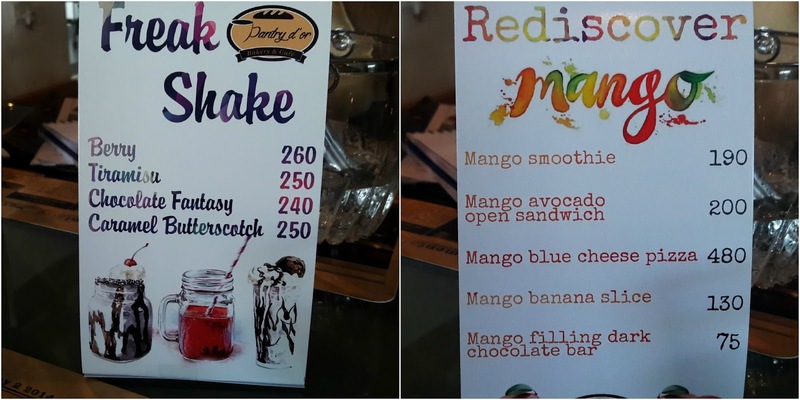 It's summer and Pantry D'or has a couple of specials - Freak Shakes and Rediscover Mango - a mango sandwich menu. We sink into huge armchairs right next to the bar counter and within looking distance of the patisserie. 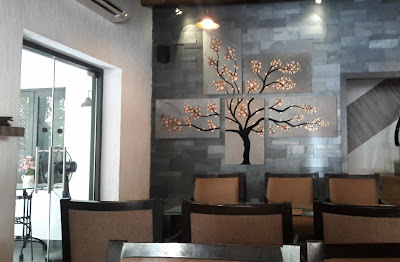 The cafe is cosy, the decor is part rustic, part minimalist and I love the grey and brown tones of the walls and furniture that add a sense of coolness as one walks in from the searingly hot outdoors. The seating is all over - the lounge where we are seated, a private room (dimly lit), garden seating and the upstairs. Finally, I decide on a Tiramisu Shake, the guys are willing to cut down on the cream and they warn me that it will not look freakish! 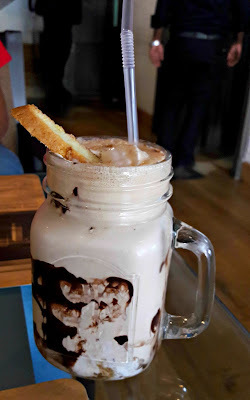 It comes in a mason jar, dark sauce creating an interesting pattern inside the glass and a slice of biscotti perched precariously on the top. It's thick, refreshing and creamy even without the additional cream and a perfect coffee rather than tiramisu shake. The menu is in French, followed by the English translation, and runs into several pages of what looks like a fancy notepad with leather covers. 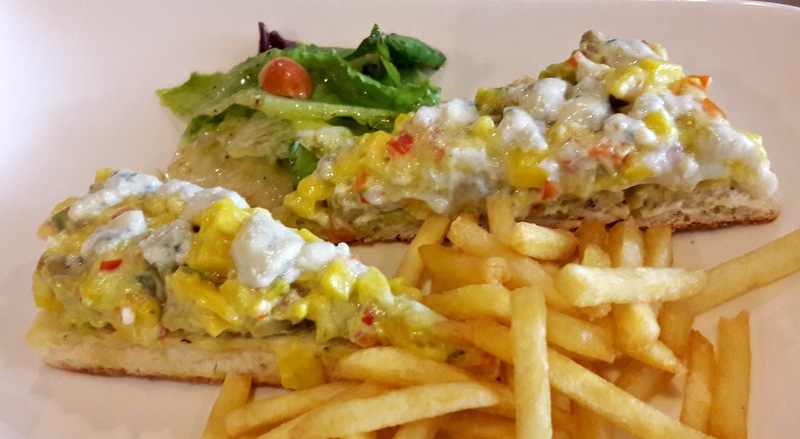 Apart from the usual burgers and pasta, they also have sandwiches like croque monsieur and pides. 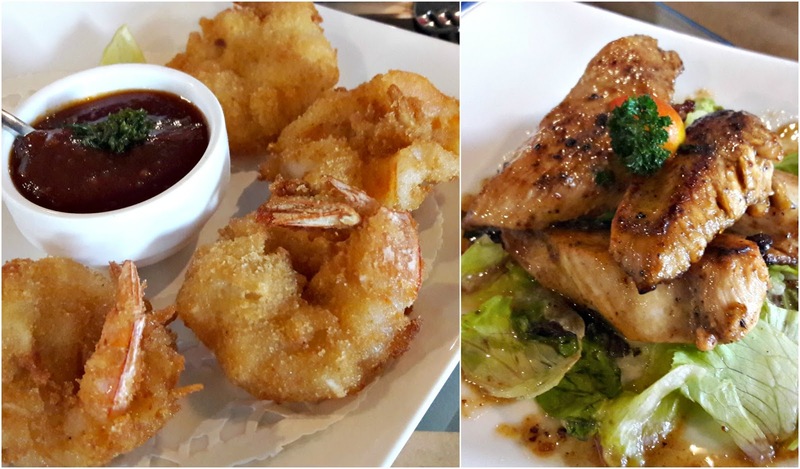 The fried coconut shrimps are fresh, juicy and moist but the jerk chicken was a rather tame affair and the meat a tad dry. Personally, I like jerk chicken bone-in as there's oodles more of flavour. For mains, we started with Poulet (chicken) Stroganoff. Pantry D'or's version of the dish had chunks of chicken in an Indian-inspired gravy; I liked only the rice which was small grained and fragrant. Chicken lasagna was not one of those with many layers but the portion was large. The bolognaise sauce lacked depth, was tangy yet bland. The Turkish lamb pide was a different story. It came with an egg which we asked to be served separately. The bat-shaped Turkish flatbread with its topping of minced lamb, cheese cubes and diced tomato was delightful. We had a hard time keeping the filling on the thin bread but that was ok - just fold it over in half and all's well! And do spread on some of the lovely garlic flavoured dip it is served with. Dessert was a large slice of chocolate praline. Drizzled with streaks of chocolate sauce and topped with a thick layer of chocolate, it looked pretty decadent; the cake layers were a little dense and the chocolate flavour was underwhelming. 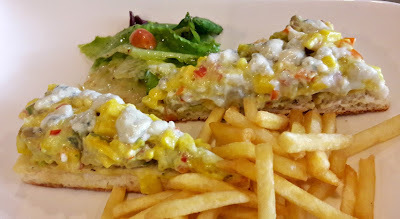 We were asked to try a mango avocado open sandwich. And to think I almost turned this down! If you like blue cheese, you will absolutely love this sweet and savoury combination of mango cubes, blue cheese, avocado and onions on toast - not any old toast either. Absolutely mind-blowing. Everything else on the plate pales in significance. The mango sandwiches will be on the menu only till the end of the fruit season. Go on - live dangerously! 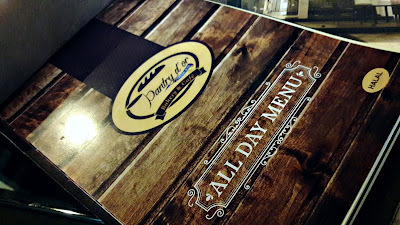 Pantry D'or is at 2/13 A, West Street Cooperative Colony, Sri Ram Nagar, Alwarpet.